It will be winter. Someone this time of year like it, some don’t, and if you are last, you can offer to pass this cold period with the help of games and applications. Last week, the App Store and Google Play supplemented by several dozens of different games and applications, and we present to your attention another TOP 10 list of new releases for iOS and Android. If you for some reason missed our last selection, follow this link. Gears is not only an instrument of torture in the film series “Saw”, but also a good puzzle game, recently appeared in Google Play and App Store. Your task is to correctly rearrange parts of machinery and to ensure their trouble-free operation. Immediately after clicking on the icon you get to the main menu of the game, which proposes to test the existing levels, create your own or play what did the other players. To explore the rules, you must choose the first option. The game is simple — you need to turn the red gear. To do this, connect them to the green with wooden. The amount of detail is limited, this is the main difficulty of the game. If you are able to use only those gears that are on the playing field, then you will get the maximum points. If the thought of an elegant solution does not work, use any extra gear, but keep in mind that for every extra used gear taken away one star. In the game it is important not to limit the imagination. Sometimes the obvious solution doesn’t work, so you have to look for unconventional solutions. A lot of levels, so bored you just do not have. Honey Bees — a new game from the Studio Chaos Theory Games, which appeared in Google Play and the App Store a few days ago. We are confident that this product will appeal to most lovers of cute and harmless games with interesting gameplay. Separate attention the game deserves quite attractive graphics which makes the game a really quality product. After all, when the gameplay itself is slightly varied, the aid comes a nice picture. While the gameplay here, though not very diverse, but is able to lure. Initially it is not clear what is required from the player. It is seen that this is still the first version, because the developers have not implemented even the tips when you first start. But it does not matter, after the first defeat, the player begins to understand the principle of gameplay. And even in this there is some sense — the understanding of the game from their mistakes. The map represents a certain area in nature. At the top is the bee nest in the lower part periodically grow flowers. From the slot after a certain time, flies a bee. The player must hold the path from the bee to the flower and back. The difficulty lies in the fact that a bee dies if it ends with the honey in his belly, the same applies to the flowers — they wilt after some time. If the player succumbs to death three bees — the game is over. Many of you are probably familiar with the game Hill Climb Racing, which has continued in the form of Hill Climb Racing 2. It is worth noting that the sequel turned out really good, but many were waiting for the continuation of such a large project more. This did not happen, however, recently in Google Play and App Store appeared a good alternative to Prime Peaks. The game offers 3D graphic with side view as in Hill Climb Racing. Due to the 3D graphics the game feels better, though, as a rule, these 3D projects on atmospheric yield solutions with 2D graphics. But this is not surprising, and physics. She is very good. There is even physics of tires. That is, the tire will vary in diameter depending on pressure. For example, when landing on the ground after a jump, the tires will lose their shape at the place of contact with the ground. Pleased with the physics of the driver. In the accident it realistic crashes, driver’s seat, and the car flies off the door. By the way, while jumping the trunk ajar. The game has many levels, maps, and vehicles. A pumping system of the transport, and the maps are tanks with gasoline. Let’s face it, the developers completely took over the concept from Hill Climb Racing, and they got it perfectly. We all know the saying: “let bygones, that bygones”, however, sometimes this rule can be neglected. For example, this can be done in relation to the game “Agent A”, which came to light a couple of years ago and was featured by Apple as one of the best games of 2015. The only downside of this product until recently was the lack of Russian localization. Not so long ago the developers added in gameplay subtitles, play then became very comfortable. The protagonist of the gameplay is the Agent that receives orders from the management and disposal of a young and charming as hell spy ruby La Rouge. The case can not be called simple, at least based on the fact that she has managed to eliminate several of your colleagues. That’s not all, later with its own message to the bottom of the sea sent huge cruise ship along with a huge number of innocent people, among them was the chief Agent. Therefore, the capture of plague beauty is not just an order from management, and nothing like a perfectly legitimate vendetta. Don’t delay, go to her luxurious mansion to search for evidence, and if you’re lucky, and herself. Here begins the most interesting, namely the gameplay in all its beauty with a broad variety of riddles, puzzles, interesting items and mechanisms, there is the wonderful retro-futuristic world. The game is all done at the highest level: since the graphic and sound aspects, and ending the game difficulty. The game has so many puzzles, secret areas, mysterious objects, to break the head will have from the start of the game and finish the final credits. However, everything that happens in the game is anything but unreasonable and illogical. Everything in the game up to its true finding, and if you’ve stumbled upon something very strange, the clues to the solution of the problem must be sought only within the limits of the game. Summarizing all the above, cool and high quality spy Agent A, finally became completely clear to us Agent A. If you are a fan of horror stories and old movies, horror movies, be sure to try your hand at the Noir game, White Night from independent Studio by playdigious. The strong point of the game is not the gameplay, and well thought out storyline. There are no expensive videos, no CGI graphics, but a dark, addictive atmosphere will force to plunge into the Affairs of bygone years, and you will not notice how on the back run down my spine. The game will take you to the USA in 1938 – the time of the great depression. You will find yourself in the shoes of a hero who was in a car accident in a forest. What to do alone in the night in the wilderness away from civilization? But suddenly, the happiness house, a refuge, a warm and cozy bed! Is it really so? Once you step over the threshold of the house, around will begin to happen mysterious events. Do you have the courage to figure out what secrets keep the walls of this gloomy mansion? Because, the main task is to learn the truth, gathering items, which in the game there are about two hundred. You will move through a mysterious house, collecting scraps of the past that could shed light on the events of the past and help you in your search. Every step will come across personal diaries of the former inhabitants of the mansion and newspaper clippings. On one reading only need two hours. Keep in mind that localization for Russian language is missing (hope it’s temporary), so in order to understand what was going on, should at least know a little English. Of course, can not read, but then you’ll just be aimlessly wandering around in the darkness home, the game quickly bored, and you never get to the point. Evidence collection will not start immediately. Once in the house, you will first need to solve a few puzzles. How to turn on a light? How to get to work rotten wiring? Of course, a box of matches (without which no self-respecting hero of film Noir, of course, the house comes out) in your pocket will be very handy, however it will not last long. Matches in a box is only 12, and not the fact that they light up the first time. In addition, having only one free hand to move around unfamiliar spaces and to move objects is not so easy. In addition to the characteristic features of film Noir (black-and-white graphics, a detective story, the VoiceOver, etc. ), the game has elements of classic horror, such as the ghosts, from which you want to run. To escape from the souls of the departed will help you all the same light. In creating the creepy atmosphere of one of the most important roles it plays a sound. A special place is assigned to jazz and even classical works. If you appreciate unhurried, the atmosphere of the story – White Night just for you. For “Legacy of Discord”, Action/RPG company Yoozoo Games, has released an update that added the long-requested system Wake-up Pets. Fortunately for all those who love to have Pets everywhere and always. Players 80 and above can now bring their furry friends in the battle, along with his great strength you get even more superiority in the battle. And here’s what you need to know about the new features. Players can get five different types of Pets, Sacred, Evil, Dragons, Brutish and Shadow. Each has its strengths and weaknesses and unique features. For example, Pets, faction Animals have bonuses in Guild battles, while the Pets of the faction of Evil will give the character bonuses and a higher combat rating in the survival mode dungeon. Wake-system is crucial to improve the ability of your pet for the passage of all modes, “Legacy of Discord”, because thanks to them, you increase your battle parameters. You will be able to start a revival Pets when rare and epic pet achieved three stars. Legendary Pets enough to reach for this only two stars. After that will be activated Artifacts Pets. You will need various fragments and stones of awakening in order to awaken the pet. The need for different materials depend on the level of your pet (rare, epic and so on). To collect these items will be much easier since 22 November, when will be the release of “the Dark Tower” (Dark Tower). It was then that players will be able to collect all the necessary in order to strengthen their Pets. READ Why Nintendo stopped producing the NES Classic Edition? The new system adds even more options and diversity in gameplay “Legacy of Discord”, giving players an additional reason to take all that you can offer us this fantastic world. N. O. V. A. — a Legacy is a unique product and its uniqueness is that it is a remaster of the first part of the series, released back in 2009. Yes, rampant fashion on remakes finally reached and mobile domains. We, however, do not take offense: space shooter sensation great gameplay, multiplayer and cheerful graphics as powerful by the standards of the platform that the game is even ported to the PlayStation 3. Was it possible to imagine a better candidate for reincarnation? Contrary to expectations, the N. O. V. A. — a Legacy from the first frame reveals that it is, of course, a remaster, but not single. Instead of aggressive strangers — the friendly commander. Instead of a green planet — the edge of the canoe. And only the hero remained unchanged. His name is cal Warden, he is dressed in high-tech armor and armed to the teeth. Yes, even charming, but thoroughly digital assistant Elena will not go away. Eye blink of an eye, and you are on Board a mysterious ship “the Pride of the colonies”. Events off the bat: cal rushing around the hallways, activate switches and push buttons. Here we shoot aliens with an assault rifle or take them off a well-aimed shot from the sniper, and now fiercely pressing the trigger of a stationary machine gun. Shield regularly takes the enemy shots, we have neither hot nor cold. Grenades flying everywhere, explosions — in short, on the screen is created hell. All without a hitch would fit into any other space shooter, but not in a mobile format. As soon as the first shock from the cosmetic changes, connoisseurs of the original N. O. V. A. will sigh with relief. Interface, locations, enemies — everything familiar and dear. The new version looks much prettier, weighs when loaded only 20 MB and flies to almost any modern device — whether it is happiness? But it’s worth a bit of euphoria to subside, as in all its glory blooms is a key feature of the restored N. O. V. A. — its shareware. Series N. O. V. A. has long been a game of a premium and justified by its quality. But at some point Gameloft deliberately set to work hoeing the field conditional free: have N. O. V. A. 3 was released in two versions, and N. O. V. A. is Legacy and is only “gratuitously, that is gift”. The whole “bouquet” of associated symptoms attached energy to perform tasks, upgrade weapons through coins and collections, advertising and even paid respawns. However, there are positive moments — random assignment, global equities and a noticeable increase in the variety of weapons. Again, don’t have to pay twice if you just want to revive old. In 2009, N. O. V. A. showed how to do mobile shooter. In 2017 N. O. V. A. Legacy sample again — this time to be re-mastered mobile game. Over the years, it has not lost an ounce of charm, and typical of shareware projects features not just her spoiled — benefited. If you were looking for shooters in their classic manifestation, and the soul is eager to shoot the aliens and save the galaxy — welcome. Studio Nekki presented the third part of the legendary Shadow Fight. What changed in Shadow Fight 3 in comparison with the previous part, and whether new product success? The main innovation of the third part became three — dimensional graphics- now weapons, armor, and the characters themselves are nicely drawn. Buying new items, the player will pump not only the skills of the protagonist, but also its appearance. The game is called “shadow Boxing” not just in Shadow Fight 3 survived the battle between the shadows, but now these shadows suggest about the activation mode “superpowers”. When the characters transform into shadows, they are available in a variety of superpowers: using chakra enhanced jump, teleportation, etc. Activate shadow mode can not only the protagonist, but also opponents. As for the second part, here the player will travel through the provinces of the fictional world, completing main missions and participating in minor battles to earn extra experience and coins. After you complete the main quests before the main character will appear in the boss — defeating him will be the final stage of the passage of a single act, which opens the next Chapter. Before each match indicates the approximate level of difficulty for character-specific weapons and armor that makes clear — is it worth trying to win or need to improve character in the gear store. The office also has not suffered changes. In Shadow Fight 3 is a joystick for movement and three virtual buttons — kick, punch (or weapon) and activate the shadow mode. In the future probably will be additional buttons that are used to throw throwing weapons and to use magic, but not yet. At the moment the player is available for three types of equipment: helmet, armor and weapons. It is noteworthy that the characteristics of the gear (damage and armor) are pumped only for a special card that comes in sets of improvements and are given as rewards for successful battles. In addition to the characteristics to improve the outfit by using special bonuses, like this: “If the character is less than 20% health, the damage of his weapon is increased by 10%”. Weapons plays a key role in the battle, and it’s not even the damage. Depending on the selected equipment are changing the battle style of your character. For example, using the spear the main character is forced to fight for the long haul, taking the hammers in the middle, and swords or axes will approach to attack at close range. The opponents in each battle curb certain weapons, and, therefore, the tactics for each enemy has its own. Therefore, universal sword or spear “against all” to pick up will not work. In summary, we can conclude Studio Nekki did a good job. The developers have created a full-fledged fighting game, and the number of games of this genre on mobile platforms can be counted on the fingers. New “shadow Boxing” will easily overshadow Mortal Combat X with its skipovym control. It is hoped that Shadow Fight 3 will not spoil Intrusive or given, and will give players the ability to upgrade characters without contributing real money. In the future the developers will add more choice of equipment, will create new levels and game objects. It is also expected that in Shadow Fight 3 will be full multiplayer, in which players will be able to join groups and fight against each other or against bosses. Sooner or later everyone thinks that he could be more effective at work and in your personal life, and in the home. There are many ways of raising their efficiency, and many of them are collected in app Maxdone, which may seem confusing, but it’s certainly capable to do a good job. The first is to say that Maxdone is not just an app. There is a web version of the service. On the website more facilities available, and all information about your goals and objectives synchronized with the application through the account that you want to have. The website will allow you to work with colleagues and friends, and to configure incoming email, which is very useful and convenient. For this reason we recommend you initially register on the site before you install the application. Explore the service, you decide how it suits you, and then download the app if you like it Maxdone. The application duplicates the features of the site. Users are able to create new tasks and work with existing to see your plan for today, to combine the tasks in the goal, create tasks with check lists and much more. In Maxdone a large number of powerful tools to plan and enhance personal effectiveness, and they can be flexibly configured by the user. To start, you will need to customize categories, set goals for yourself, and then move on to creating a task. Indicate the deadlines and you will see what you need to do it today. The presence of check-lists will help to cope with the problem efficiently. In other words, Maxdone helps to take yourself in hand and bring order to their Affairs. As long as mankind exists, there has been fashion. People have always watched who and how dressed, and the costume has evolved inseparably from the material culture. In ancient times girls and women tried to imitate the ladies of the higher classes, and with the advent of film and television – canadiam and stars of show business. Currently searching for a desired image is simplified to impossible just to take one picture of your idol, and you exactly will know in which online store, you can buy his entire outfit. It is quite possible with the application of Screenshop, which included popular TV star Kim Kardashian. Users Shazam the principle of operation of Screenshop will be familiar. If Shazam can get all information about playing the current song, Screenshop will allow one photo to know that wearing the image of her man and where to get same or similar. Just upload the desired picture into the application (for example, making a screenshot or saving a picture from the Internet), and it will offer you several suitable options. Click on any and you will immediately go to online store, where can I buy. Again, Screenshop takes both pictures downloaded from the Internet and made your own screenshots, for example on the page, stars in Instagram. Discreetly take a photo of a colleague at work, download the app, click on the picture, and immediately will know where he or she bought his clothes. It should be noted, Screenshop is not limited to women’s wardrobe. Nice thing is the app is looking for the best options in different price categories. There are masterpieces from global brands, and proposals from democratic brands. Of course, one should not hope that you will always be able to find exactly the same article of clothing. However, in any case Screenshop will offer several similar, though not identical, options. Note, the app will tell you where you can buy a similar thing, however, is not an absolute source of information about which designers dress the stars. But it is even better, because you will be able to try on a similar way and save a substantial amount. Some of these games and applications you like the most? Share with us in comments. You are reading an article on the Top 10 apps for iOS and Android (13-19 November). 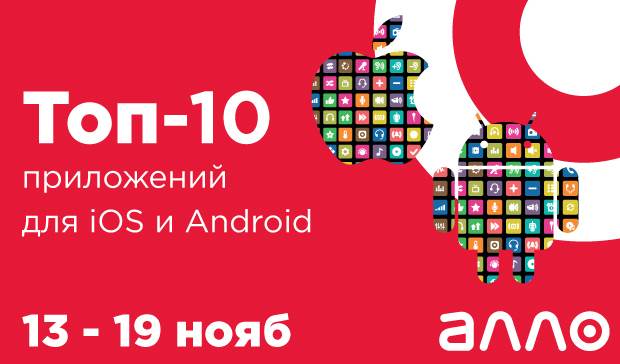 All materials on the site Gadgets F, а также и статья Top 10 apps for iOS and Android (13-19 November) - written for the purpose of information enrichment and we are happy if you like our magazine.